A vintage shop that's not cheap, but priceless. 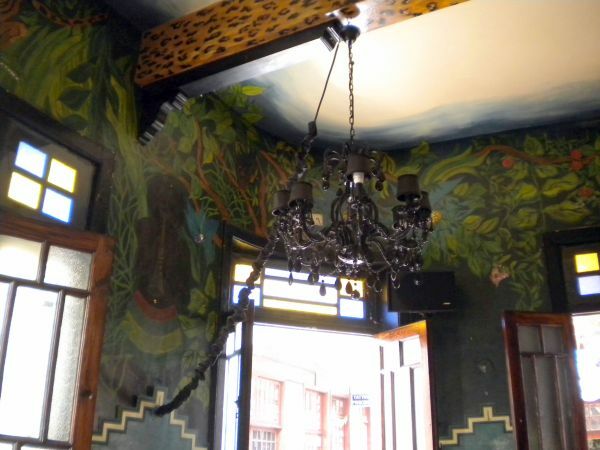 The vintage shop with all its decor and adjoining bar in the picturesque old quarters of town is better known to insiders as the ancient Ebano Cafe of Puerto de la Cruz. Why is it a must see? It's a good place to relax or to meet friends. It's a spot to savour a beer with or without Tapas or aromatic coffee and delicious Cheese or Black Forest Cake in unusual surroundings. There may be the added perfume of flowering Oleander from the church square in the air. A wedding assembly, parades and processions can be watched on its nearby square. 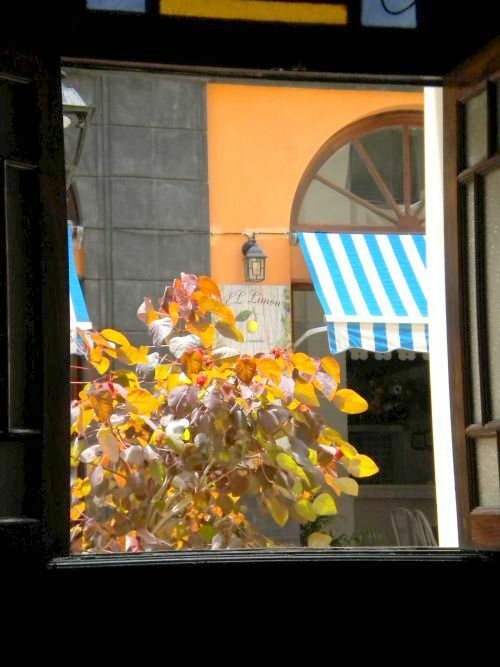 In Winter occasionally, there's the sound of baroque music through an open back door of the venerable temple beside it that was once mostly financed by wealthy Irish and Portuguese expat merchants, such as the Whites, the Cologans and the Tolosa . So what's the vintage shop like? 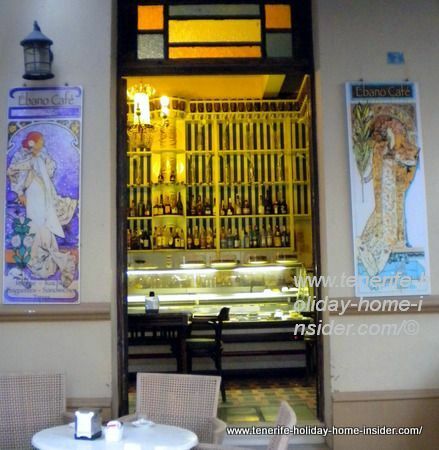 The Belle Epoque art with three works by a long gone Czeck artist Alfons Mucha adorn its main facade together with Tiffany glass above a door. These Art Nouveau paintings are like a promise of something more nostalgic to come. The attraction which draws you in. Nostalgia is also hinted by alluring illumination and some old fashioned shop fitting which can even be seen from the street. The chandelier's light comes from inside the cafe. There, shop items take up more space than the Art Nouveau chairs and a few marble- top tables. 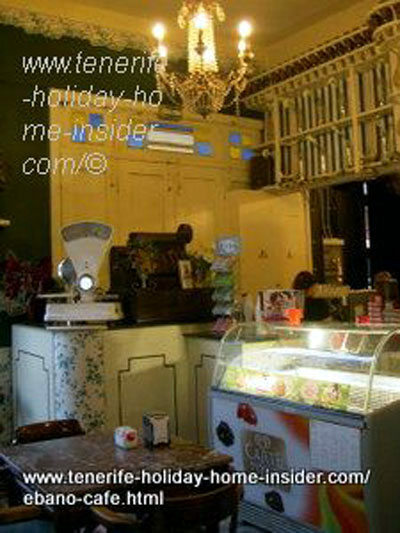 A large classic chiller fridge displays many sumptious cakes whose recipes date back many hundred years. Only the ancient king of cakes called 'Baumkuchen' (tree cake) which graced all European courts is missing. 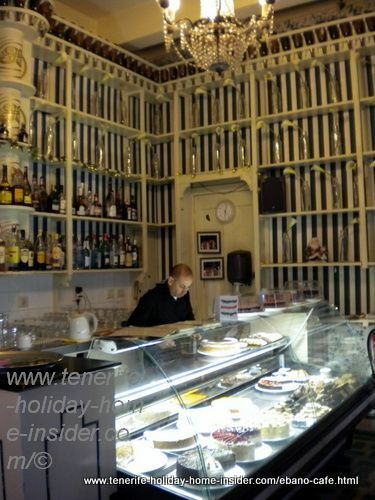 The walls of the vintage shop which was fused with the cozy cafe, present the most captivating focal point. More than 400 narrow cubbyholes made of timber cover them. This Victorian shelving is painted in brilliant white. Long ago, medicines and drugs of an ancient pharmacy where stored in it. Now, liquor bottles stand in the very confined spaces. The top shelve has its own charm. There, the slits are even smaller. 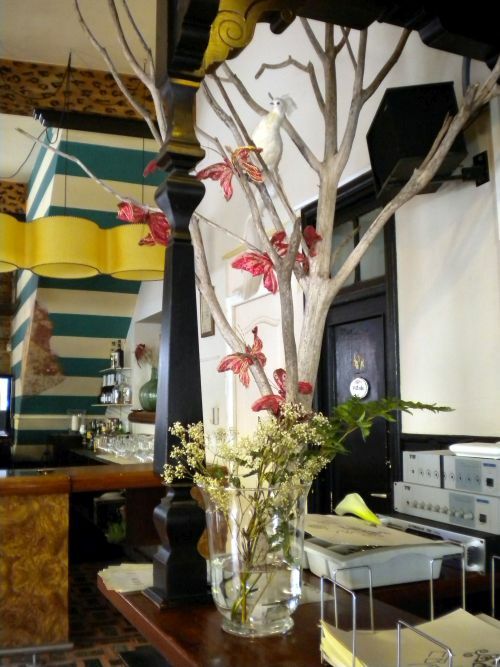 Wine bottles are in them, but don't stand upright.They contained Malvasia once which made history for Puerto de la Cruz, the Tenerife Islands. Shakespeare confirmed this many times. The bottles lie in each hole and their bottoms are showing out, which is most peculiar. That's a very fitting ceiling skirting board for a room that is brimming with memorabilia of olden days. Of course, a vintage scale stands on one of the side boards of the antique cafe. I am not sure if I actually heard the rattling noise when the leaver of the old calculating machine was turned. The magnificent, ancient lamp also reminds Art Nouveau. However, there isn't any fat cat anywhere to be seen, contrary to a vintage shop which I once discovered in the Netherlands. There also are no groceries and other items for sale. 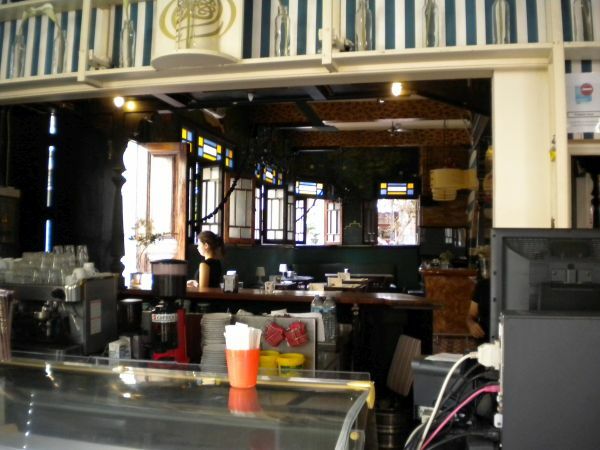 Only liquor, tea, coffee, pastries and Tapas are on display. 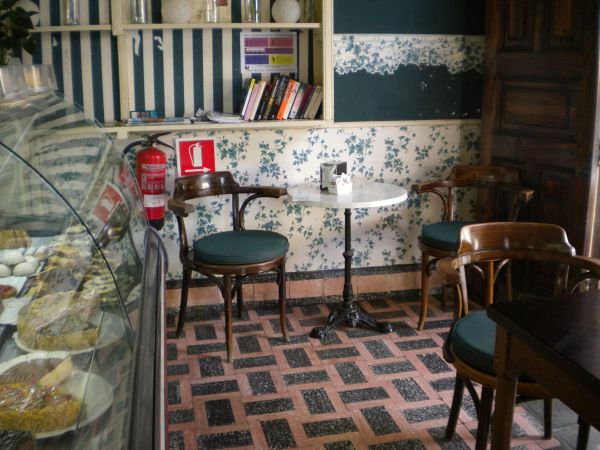 Mind that Spain vintage is famous for genuine old customs in shops where impressive assortments can be bought. Anyway, that vintage shop with street-cafe takes you down memory lane, although not way back like some Harry Potter scenes. It reminds an era of the later 19th and early 20th century when the word stress was still unknown. It was also the Era of Sarah Bernhardt, Henri de Toulouse Lautrec, the Can Can of the Paris Moulain Rouge, besides Alfons Mucha. The years just before the Great Gatsby. It's a place for people who have time and rarely use their smartphone there. 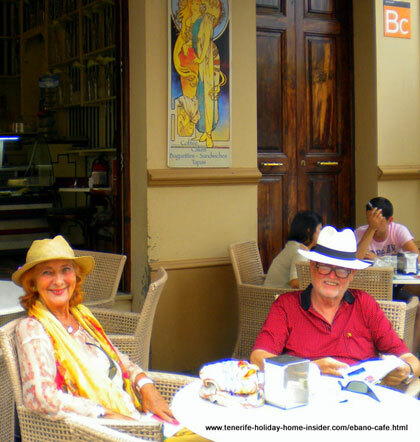 Indeed in this laid back location, you may still have a chance to talk to somebody, such as the lovely Dutch couple in the photo. Not only the lady's Chiffon blouse and shawl matched the Alphons Mucha Art Nouveau fashion behind her. In fact both guests were delightfully vintage. 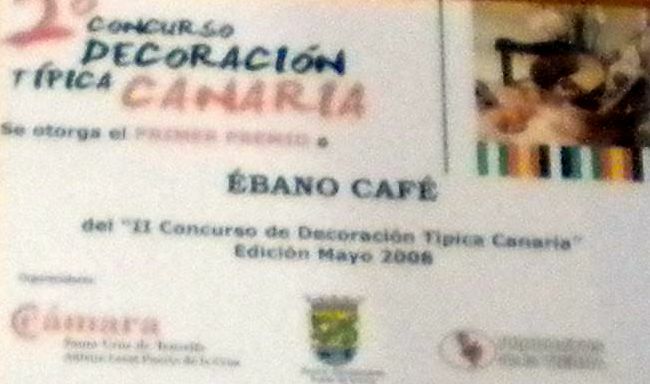 Surprisingly, not much has changed at the street corner Ebano Cafe one of most prestigious and charming of cafes in Tenerife Mind it's also listed as a BarC, by the way. 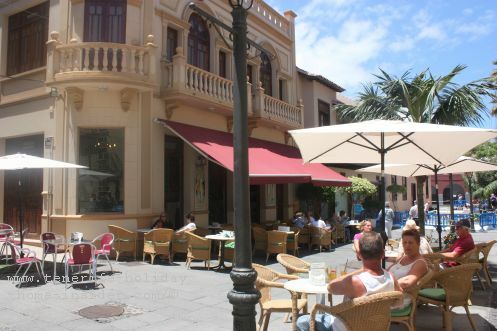 Tenerife restaurants, bars and cafes stop taking part in Tapas routes when they have enough steady and repeat customers. 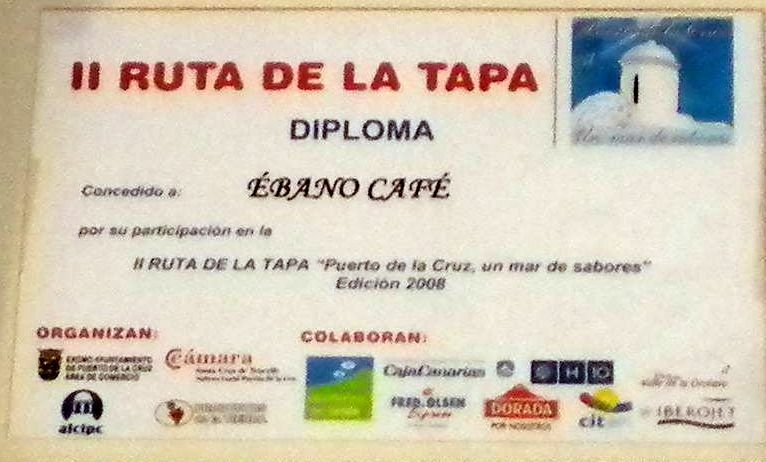 In fact, competitions for a best Tapa are expensive and time consuming for a business owner. Information about the Belle Epoque here.